Originally, I wanted to end the week with a whole wheat sourdough bread. I just love the tangy and rich flavors of sourdough, and combining that with the nutty rusticity of whole grains just makes it all the better. But of course, the week got away from me, and when I finally had time to make it, I only had one day. All my dreams of complex flavor and weeks of tangy sourdough sandwiches went out the window. Not to mention, even after I widened my search beyond sourdough, all my cookbooks offered up only whole wheat recipes that would take at least two days, if not longer. I needed something much faster. Somewhat distraught, I began putting away the groceries. And what to my wondering eyes should apppear, but on the back of the bag of King Arthur whole wheat flour was a recipe! 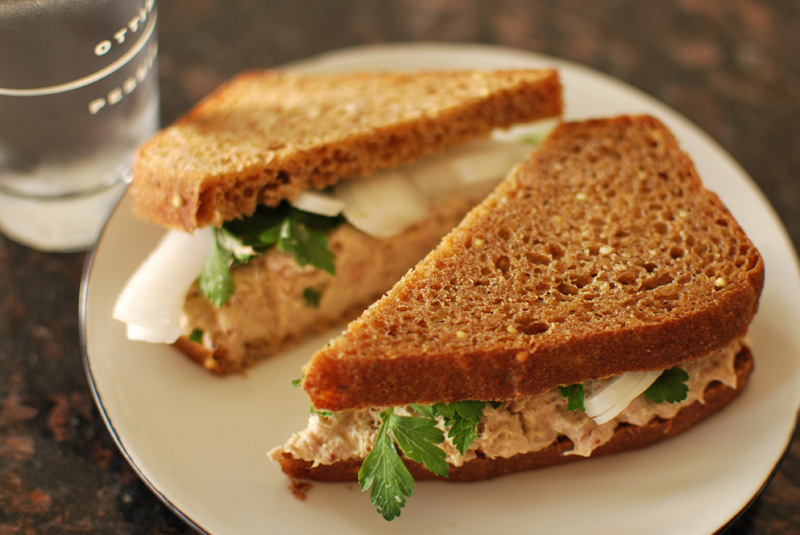 A recipe for whole wheat sandwich bread! And it only took a few hours! Salvation! Funnily enough, this bread turned out far better than the Six Grain Bread I made the day before, one I had much higher hopes for. This bread is really, really good! I love that it’s 100% whole wheat, and the flavor is just lovely. I added some vital wheat gluten to improve the texture, but feel free to leave it out if you don’t have any on hand. If you bake a lot of whole grain breads, however, it’s a good thing to keep around, as it will make a major difference in the airiness of your bread (long, technical story short). I also added some flaxseed for extra nutrition and flavor, and tossed in a handful of millet, as I love the texture it gives. Millet also looks quite pretty in a slice, little round bits of mustard-yellow. You can certainly leave it out, but I quite like it. This wraps up Sandwich Bread week; and I promise this upcoming week will be back on track with the normal posting schedule! Thanks so much for your patience and understanding! 1. In the bowl of a stand mixer, whisk together the flour, dried milk, salt, and yeast. Add the water, olive oil, honey, and molasses. Using the dough hook, mix at low speed until a rough dough forms. Increase the speed to medium and continue kneading for 6 to 8 minutes, or until the dough becomes smooth and elastic. Add additional flour by tablespoons if needed to achieve the proper consistency. Add the millet and flaxseed, and mix until fully incorporated. 2. Transfer the dough to a lightly oiled bowl. Cover tightly with plastic wrap and let sit at room temperature until not quite doubled in size, about 50 to 60 minutes. 3. Lightly butter a 9 x 5 inch loaf pan. Turn the dough out onto a lightly floured work surface. Gently press to deflate slightly, and shape the dough into a 9 inch roll or cylinder. Transfer the roll to the prepared pan, cover loosely with lightly greased plastic wrap, and let rise at room temperature until doubled in size, about 1 hour. Preheat the oven to 350° F.
4. Bake at 350° F for about 40 minutes, or until golden brown and fully baked. When done, an instant-read thermometer should register 190° F when inserted into the center. Remove the bread from the pans, and let cool on a wire rack before slicing. 1. This bread can be stored in a plastic bag at room temperature, or frozen. Do not refrigerate it! 2. The vital wheat gluten is optional, but it will do wonders for the texture of your bread, as it will with most whole grain breads. You should be able to find it at most natural food stores.